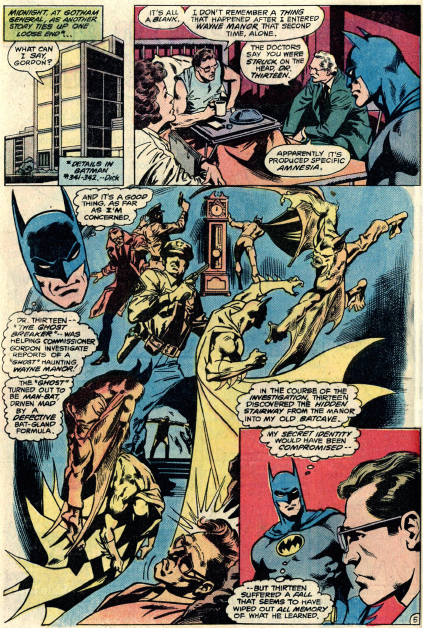 The story in Detective 517 (Aug. 82) is the middle part of a tale, which began in the previous issue of Batman, and ends in the succeeding one. 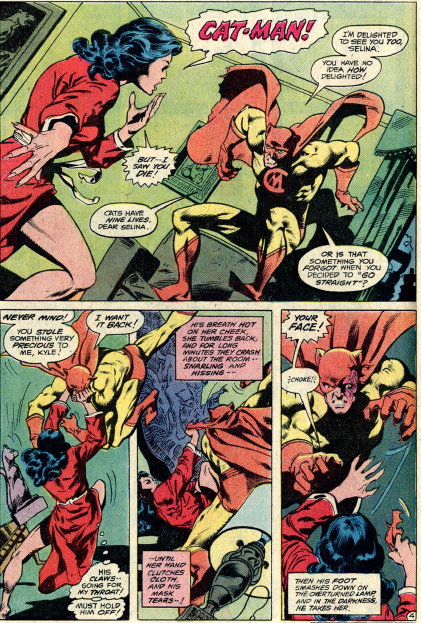 As such, Gerry Conway, Paul Levitz, Gene Colan and Tony de Zuniga have a bit of filler time. 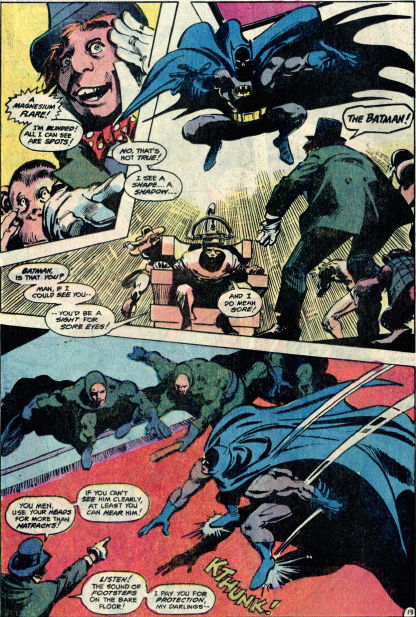 Batman spends the duration of this issue fighting crime as best as he can. His vampiric powers are a help, but he has to fight within himself to suppress the blood lust. 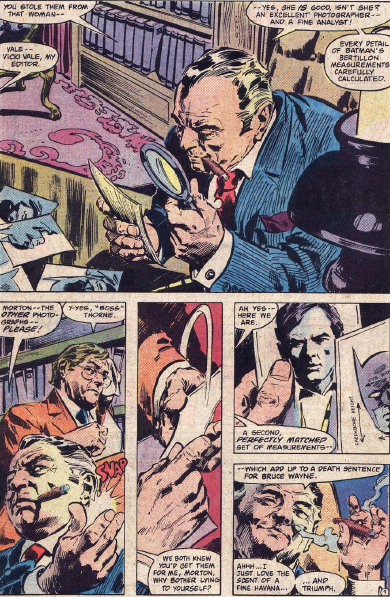 Boss Thorne ordered Vicki Vale’s editor to steal her photographic proof of Batman’s identity, and in this issue he peruses her shots and calculations, and decides that she is right, and Batman is Bruce Wayne. 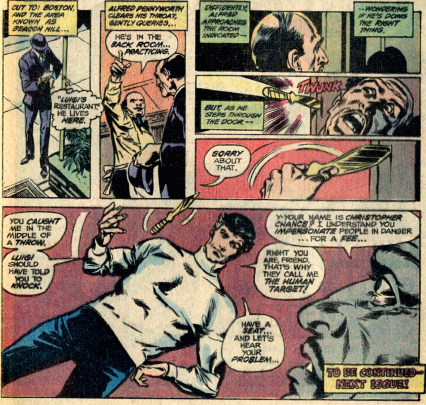 The issue also finds time to give backstory on the vampire that turned Batman, which makes the best use of Colan, whose long history of horror comics shows in the flashback. 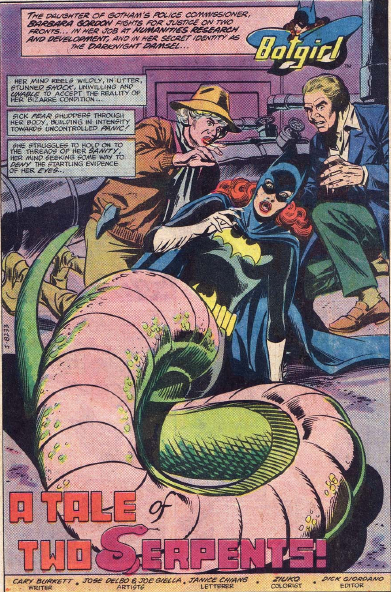 The Burkett/Delbp/Giella creative team that has helmed much of Batgirl’s latest run has their last story in this issue, concluding the Lady Viper storyline. 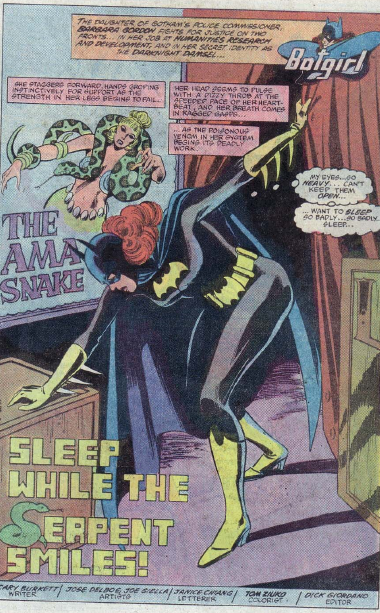 Batgirl heads to a hospital, and it proves surprisingly quick and easy to cure her of Lady Viper’s body-changing attack. Back on her own two feet, she goes after the murderer again. 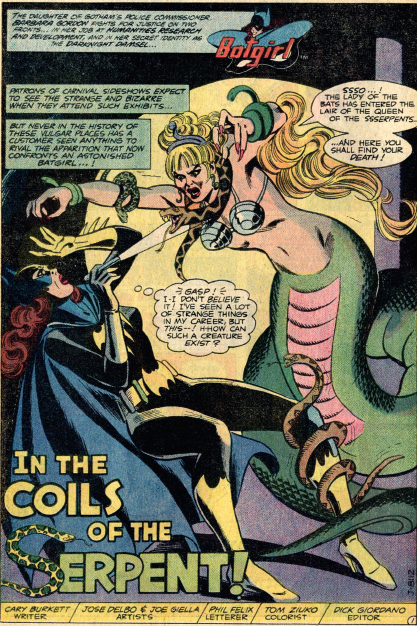 The fates are on Batgirl’s side, as Lady Viper discovers that her own transformation was not yet complete, and she changes fully into the body of a snake. 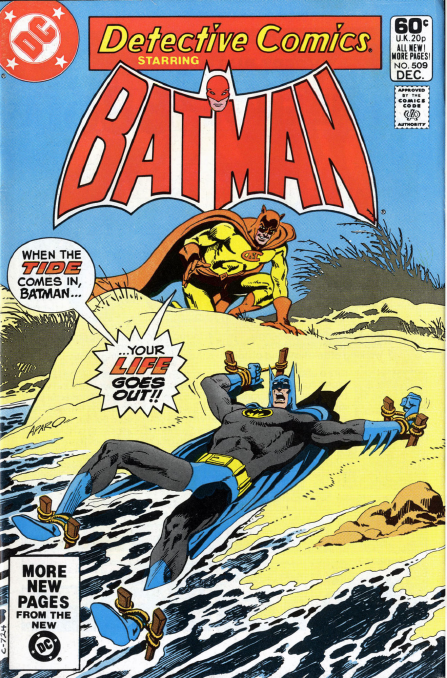 Batgirl’s series runs for one more 2-parter, with a different creative team, but both Jeff and Jim are nowhere to be seen. Jeff has not appeared since flirting with Supergirl. 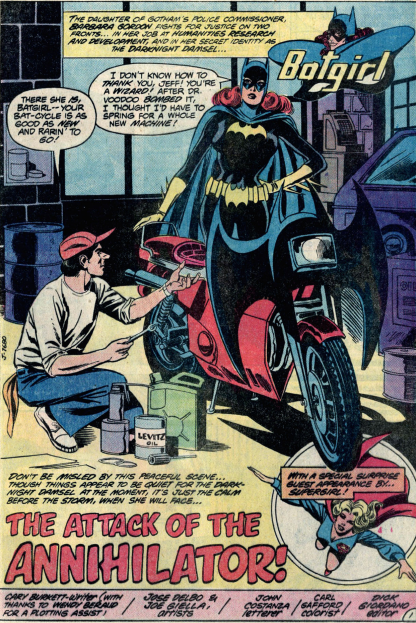 Did Batgirl never forgive him for that? And Jim’s interest seemed to wane following the trial. 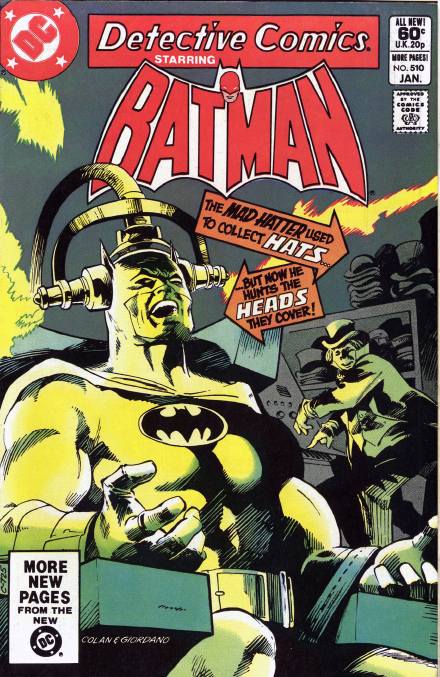 The cover for Detective 515 (June 1982) was a real torment for me. At 16, I thought it looked too childish to want to buy it, but it also really intrigued me. 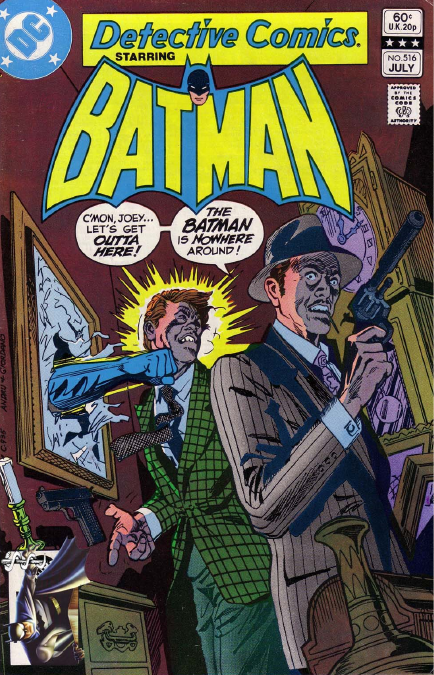 The story, by Conway, Newton and Chiaramonte, is also based on an early Batman story, with the Crime Academy. To be fair, this story has been retold at least five times by now. 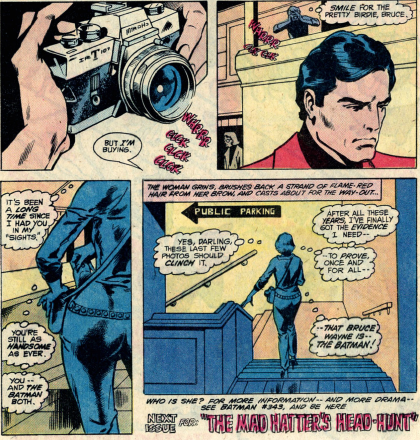 Vicki comes to Wayne Manor with her photographic evidence that Batman is Bruce Wayne, but almost begs Alfred to prove her wrong. With Batman busy dealing with the graduates of the academy, he decides handle this himself. 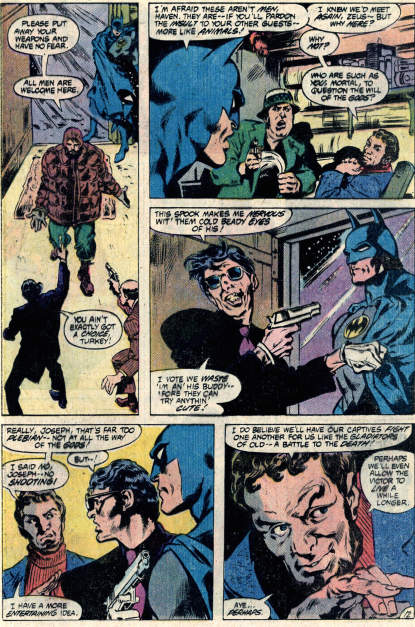 Batman adopts his Matches Malone disguise and joins the academy. 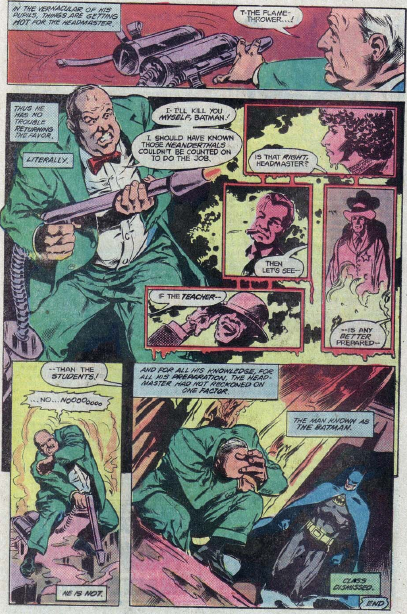 Alfred contacts master of disguise, Christopher Chance, the Human Target. 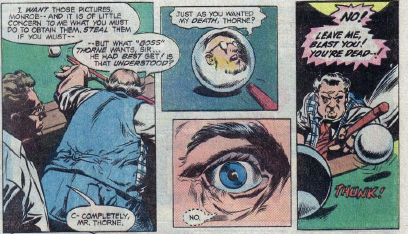 A surprise to see him, but you can see the wheels working in Alfred’s brain. 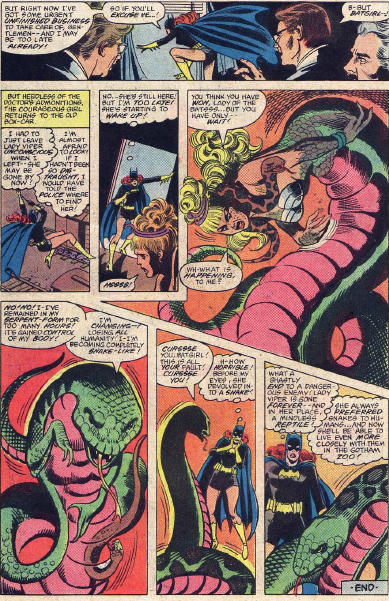 Batgirl and Lady Viper spend the whole of this chapter locked in combat, but Burkett, Delbo and Giella also work in an important flashback. 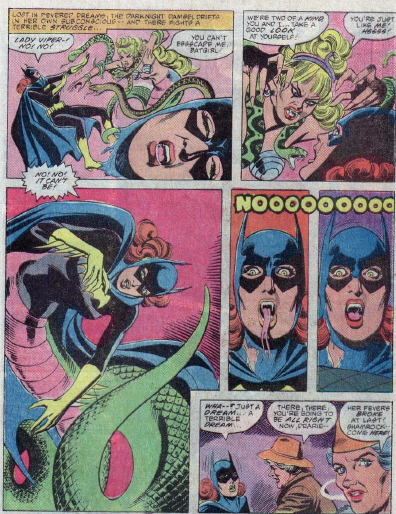 Lady Viper relates her story to Batgirl as she chokes her. 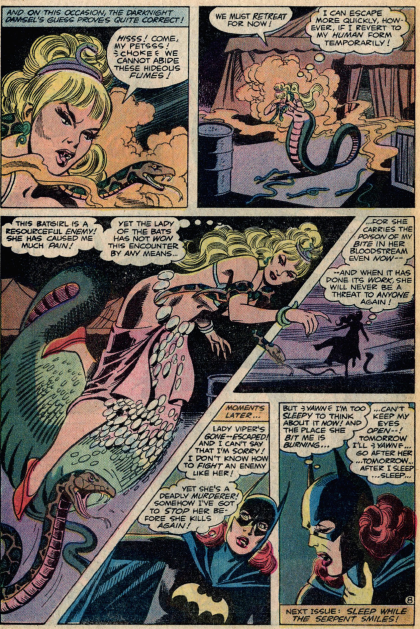 How she found snakes preferable to men, and found a snake god statue that she felt a special connection to. A moonlight ritual altered her form to the one she has now. 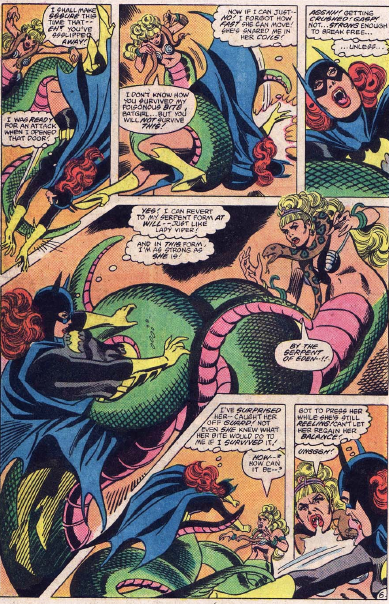 Lady Viper blows a noxious powder at Batgirl, and flees. 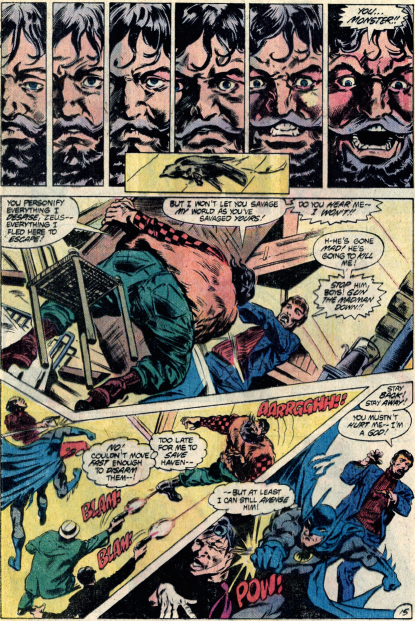 Len Wein, Don Newton and Frank Chiaramonte provide a solid, one issue story in Detective 514 (May 1982). Maxie Zeus has escaped from Arkham, and is being driven north through a dangerously snowy, mountainous region. 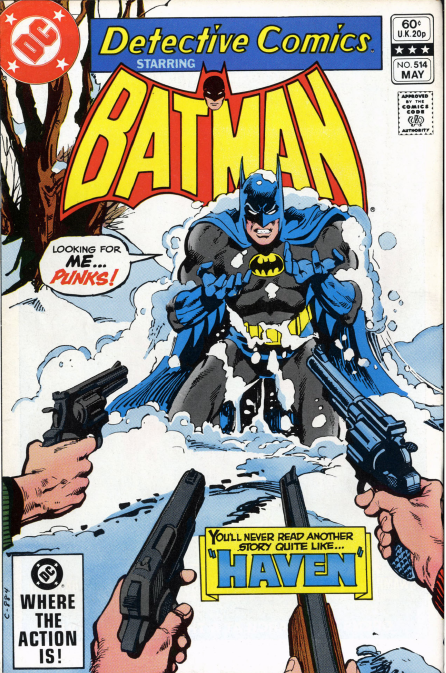 Batman is in pursuit, but spins out on the ice and goes off the road. He is rescued by a nature and peace loving recluse who calls himself Haven. 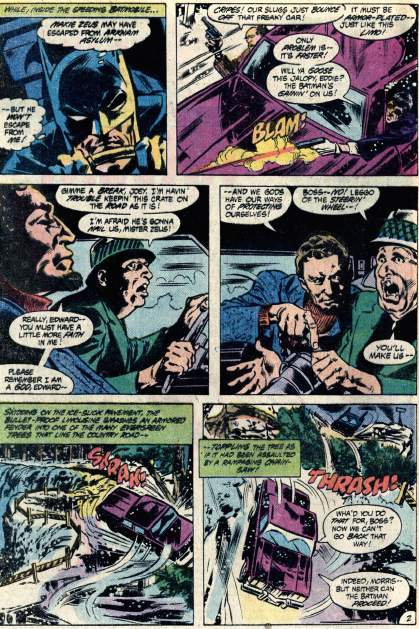 Batman attempts to get back to the Batmobile, but aside from being attacked by a bear, cannot find his way. Maxie Zeus and his men also wind up stuck in the snow, and everyone winds up at a restaurant, with Zeus’ men holding guns. Zeus commands Haven to fight for his amusement, but Haven will not. Maxie shows his extreme arrogance, explaining how he is a god, capturing and crushing a bird to show his might. Bad move. The dead bird sets off the massive Haven, who trounces Maxie’s men, with some assist from Batman. Haven is killed, though. It had been a couple of years since Maxie Zeus had appeared, and it would be a couple more before he returns, in the pages of Batman and Outsiders. 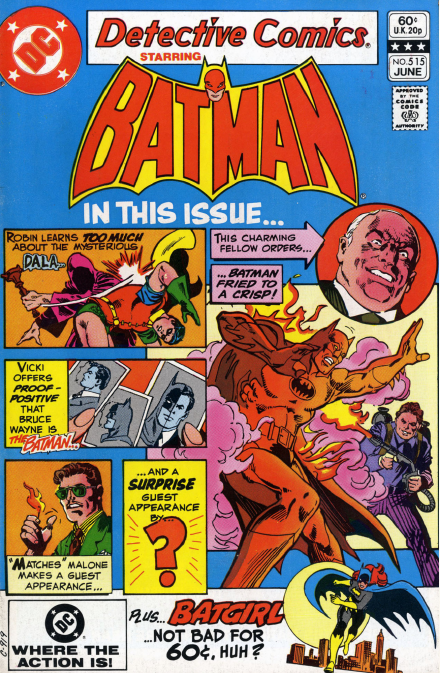 Cary Burkett, Jose Delbo and Joe Giella give Batgirl a scary new enemy in this story. 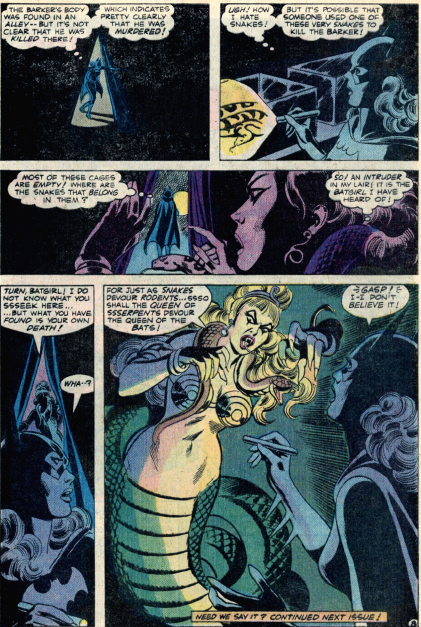 Lady Viper, Queen of the Serpents is a heck of a name, but do you really want to argue with her? And whatever you do, don’t call her Charlene. 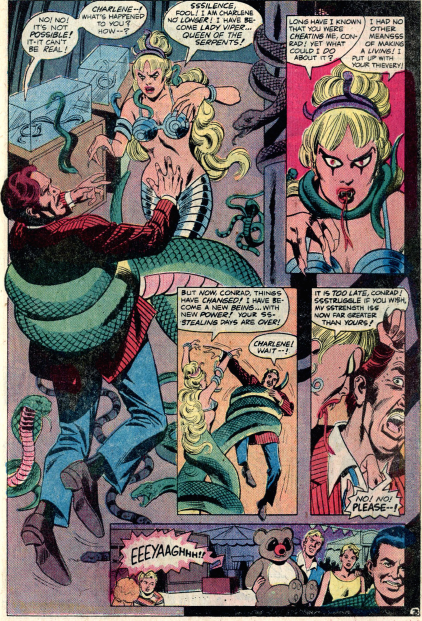 After being transformed into a snake-woman, she returns to the circus and kills the barker who had been cheating her. 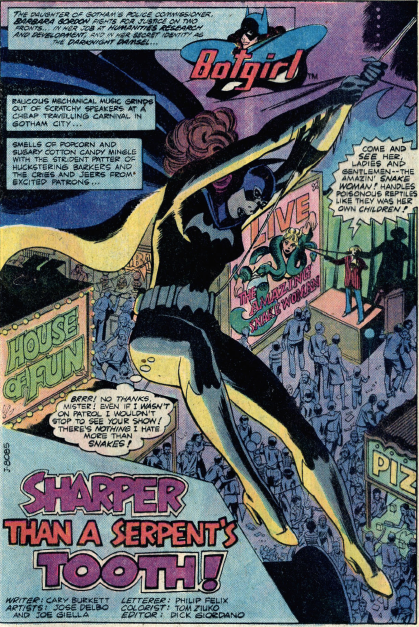 After his body is found, with what appear to be vampiric bite marks, Batgirl investigates, heading to the circus he worked at, where Lady Viper is none too pleased to see her. 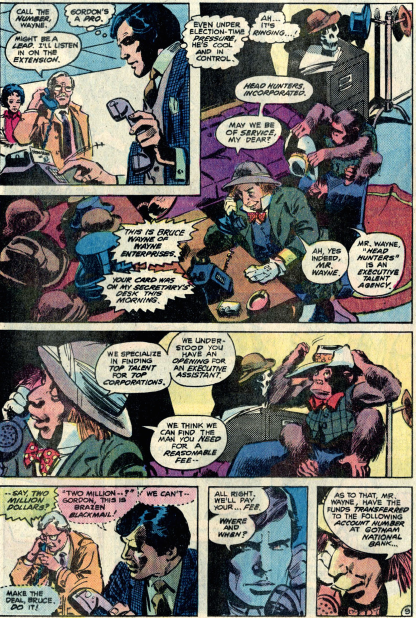 This is the first major appearance of the Mad Hatter in years, reverting to his original appearance, like the Tenniel illustrations from Alice in Wonderland. The mayoral race between Hamilton Hill and Arthur Reeves is heating up. 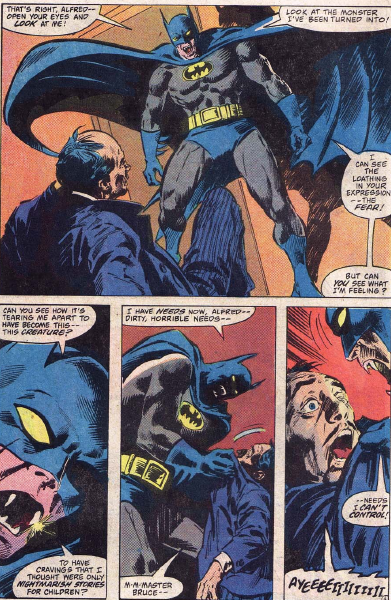 Reeves tries to publicly embarrass Batman, but it backfires on him. 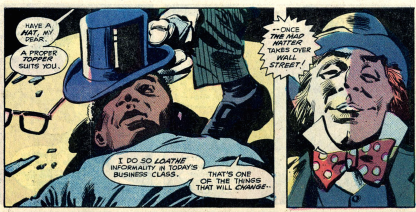 Lucius Fox is kidnapped by the Mad Hatter, who plans on using his knowledge and position to raid Wall St.
Of course, the Hatter’s plans include Batman, and he lets Bruce Wayne know that he has taken Fox. 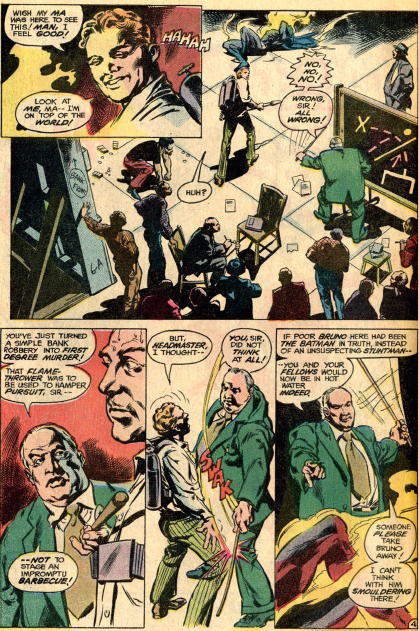 At the time I was not happy with Gene Colan taking over the art, I preferred Don Newton. But I have come to appreciate how moody Colan made this series. The Mad Hatter proves a fairly easy victory. He’s rusty after all these years. As the story ends, the bigger threat by far is Arthur Reeves. 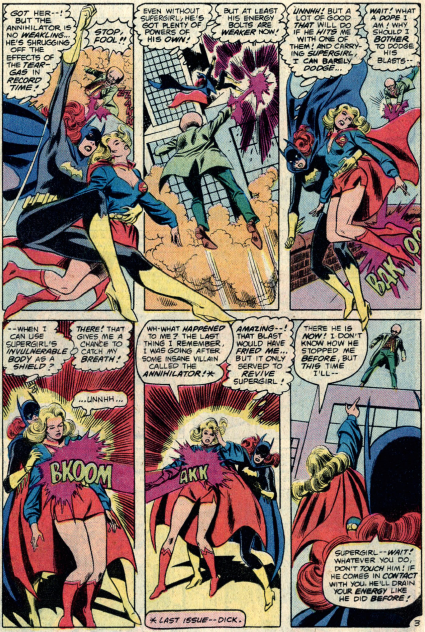 Cary Burkett, Jose Delbo and Joe Giella conclude their three-part team up of Batgirl and Supergirl in this issue. 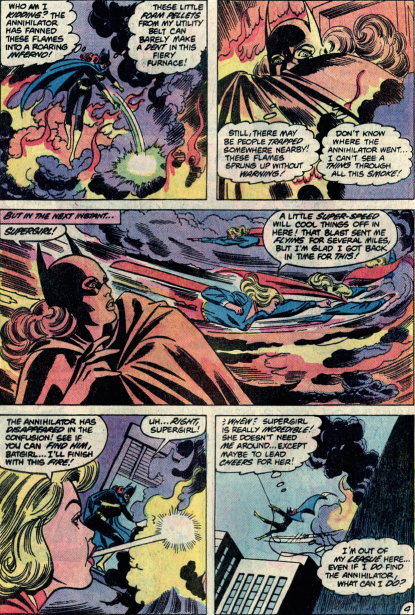 While Supergirl continues to battle the Anhilliator, Batgirl pays close attention to the effects that her various attacks are having. Though the villain seems invulnerable, Batgirl has noticed some weakness. Batgirl gets Supergirl to freeze the villain once he has been weakened, which causes him to revert back to the scientist he once was. Then they just don’t seem to care about him anymore. They don’t take him to prison or anything, just go off their separate ways. Supergirl and Batgirl’s next time together is int he pages of Crisis on Infinite Earths, a scene expanded on in a DC Comics Presents. 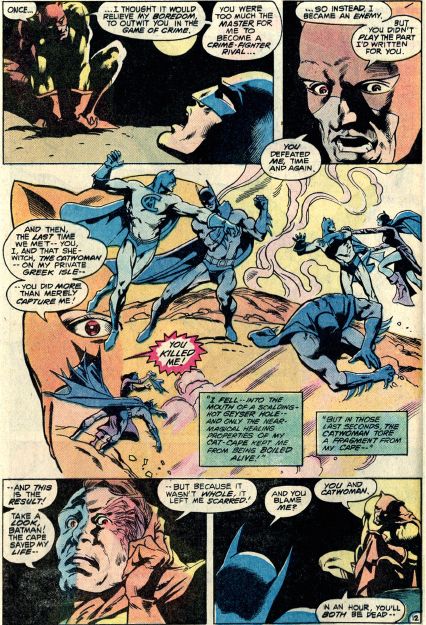 Cat-Man returns in Detective 509 (Dec. 81), making trouble for both Batman and Catwoman in this story by Gerry Conway, with art by Don Newton. Things are looking promising for Bruce and Selina as this issue begins. She has been trying to put her criminal past behind her. 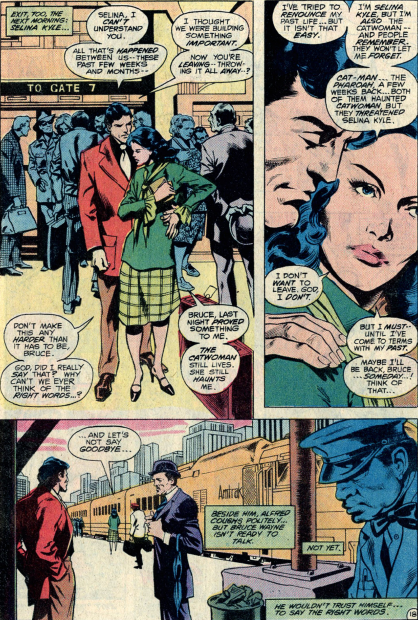 Cat-Man shatters the happy mood as he bursts in on Selina. His face is mangled, the result, he believes, of the tearing of his magic cape the previous year. 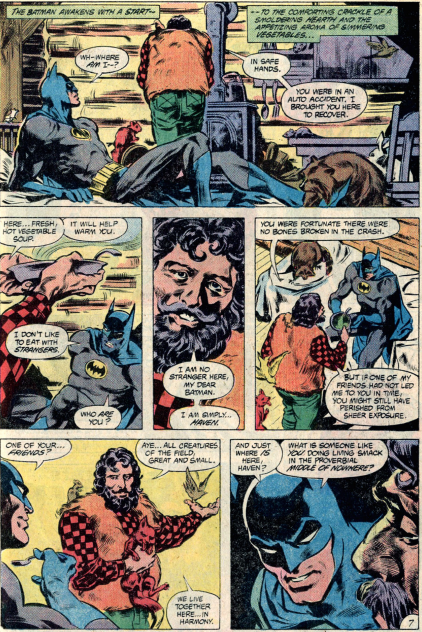 Batman also checks in with Dr. 13. 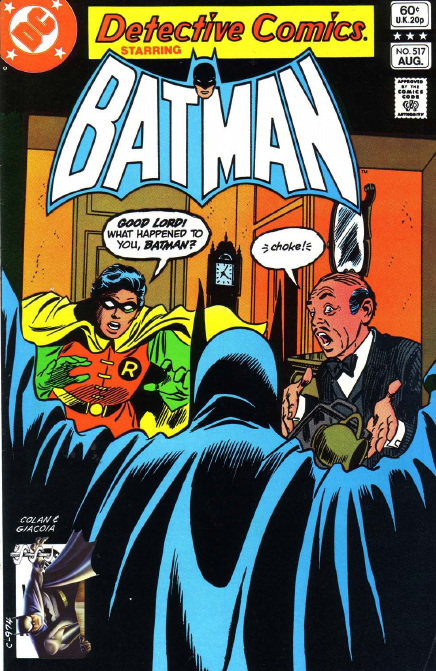 He had been checking out the supposed ghost in Wayne Manor in recent issues of Batman. Batman’s solicitous behaviour is really a cover, so he cam make sure Terry saw nothing that would indicate Bruce is Batman. Cat-Man really has little to complain about. He wouldn’t even have survived their previous encounter if it wasn’t for the cape’s 9 lives, and his facial scarring is nasty, yes, but it’s a bit much to blame the people he attacked. 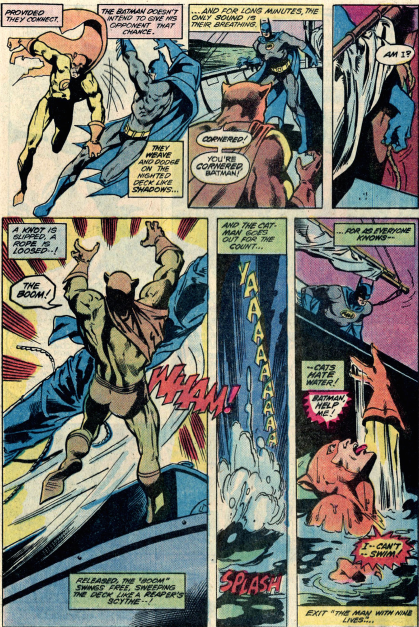 Cat-Man’s vengeance plot brings him nothing but another close call with death. He returns in a couple of years. Though he is unaware of it, Cat-Man’s plan actually does have a negative impact on the lives of those he hates. 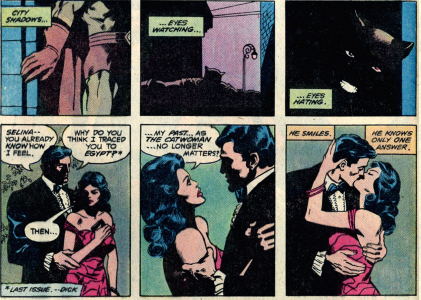 Selina blames her Catwoman past for the attack, and leaves Bruce, until she can be sure her past is in the past. Actually, she winds up coming back in less than a year, in the pages of Batman. 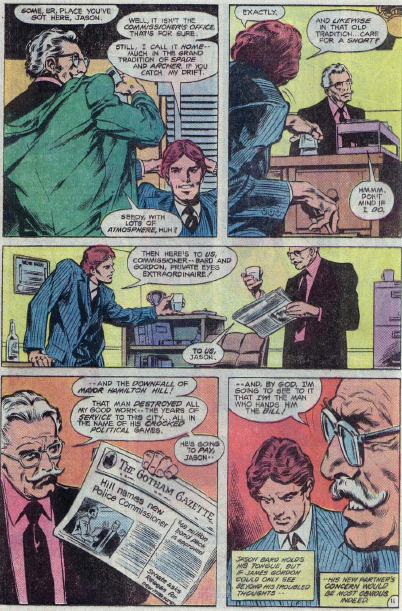 The story ends with a tease for the return of Vicki Vale. She appears more properly next month in Batman, trying once again to prove Batman is Bruce Wayne. 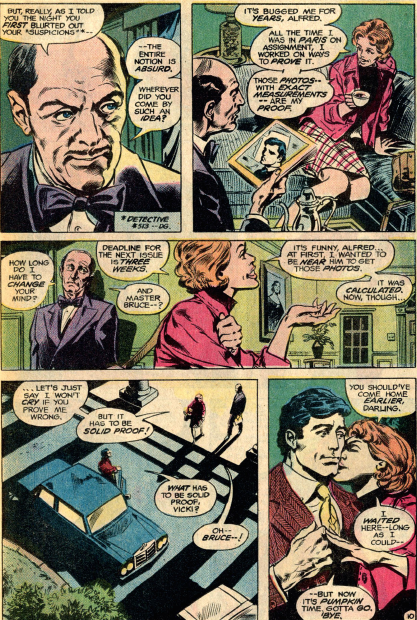 Vicki Vale really hadn’t been used since the early 60s, although she did cameo in an issue of Batman Family in the 70s. Sueprgirl discovers she is not as powerful as she thought in this Burkett/Delbo/Giella story that continues the battle against the Anhilliator. 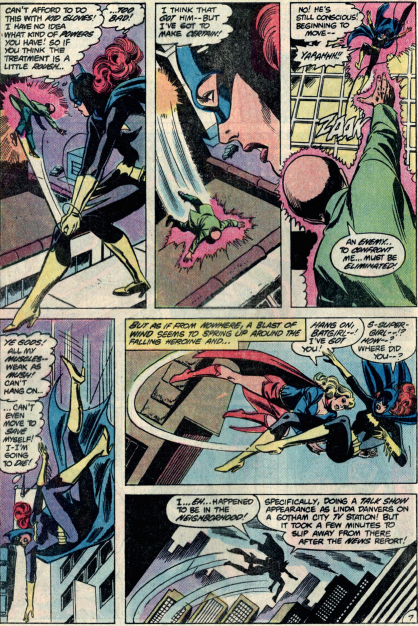 Batgirl actually gets to swoop in and rescue Supergirl, although she needs to use her unconscious body as a shield to protect herself. 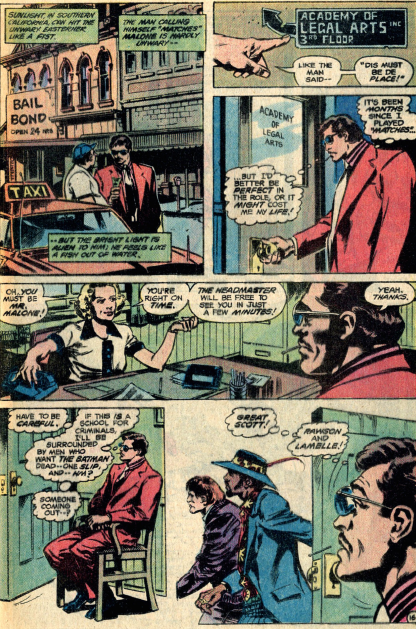 Batgirl also finds herself getting jealous when Jeff pays attention to Suerpgirl. 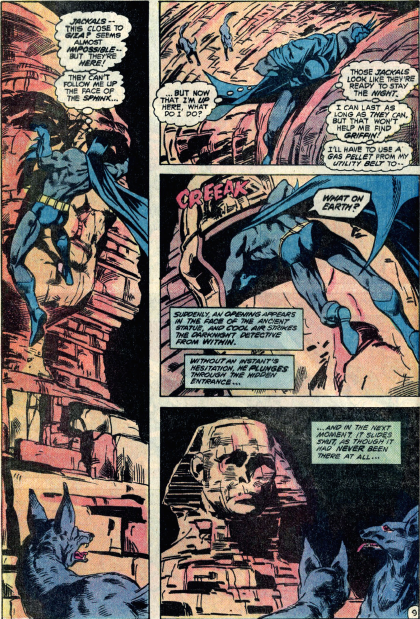 Catwoman gets kidnapped, and Batman is off to Egypt in Detective 508 (Nov. 81), a story by Gerry Conway and Don Newton. 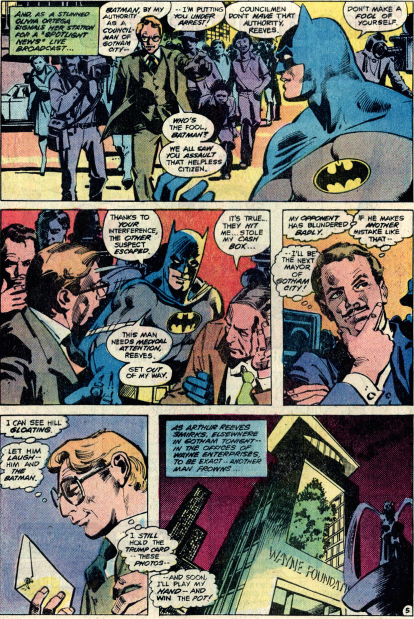 Bruce Wayne discovers that Selina Kyle has gone missing right at the top of the story. 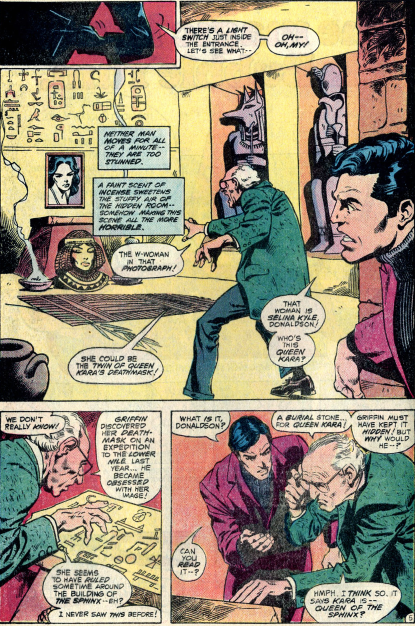 Clues in her apartment connect her to the Egyptian exhibit at the Gotham Museum, and Bruce goes to investigate. 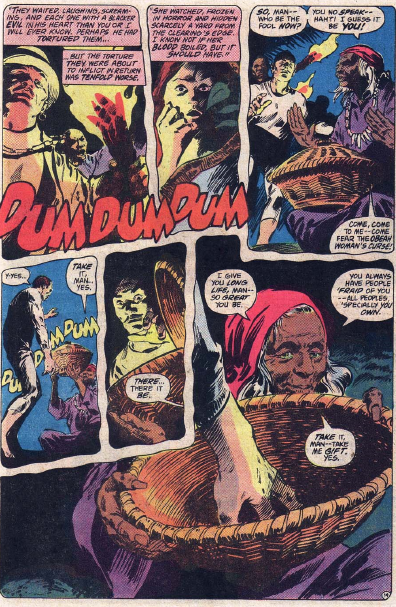 He discovers that Selina resembles a long dead Egyptian princess, and that the curator has disappeared as well. 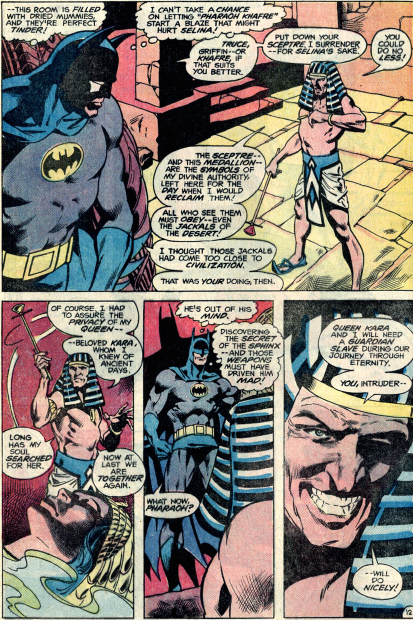 So Batman flies off to Egypt. He really lucks out in this story. He heads to the Sphinx, gets chased by jackals, climbs the face of the sculpture and just happens to find a secret passage into it. One cannot help but think of King Tut while reading this story. A curator, an Egyptian obsession, dressing up in a costume. Even the storyline resembles, loosely, one of the King Tut stories from the tv series. But there is no fun to this character, and I am really not certain if it was inspired by Tut, or the similarities are simply due to them both being Egyptian themed characters. 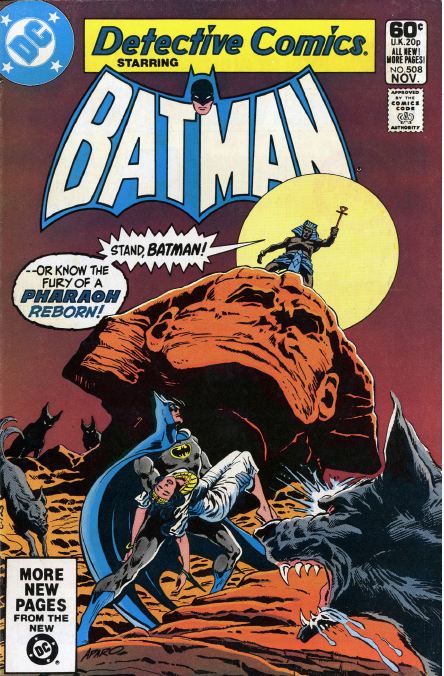 At any rate, Selina gets rescued, and then she and Bruce have some time together to see the pyramids along the Nile. 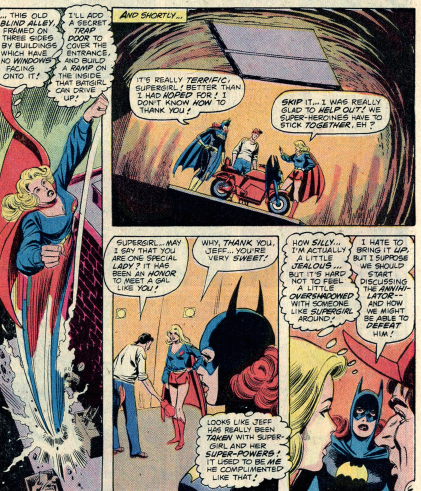 Supergirl joins Batgirl for this three-part story by Burkett, Delbo and Giella. 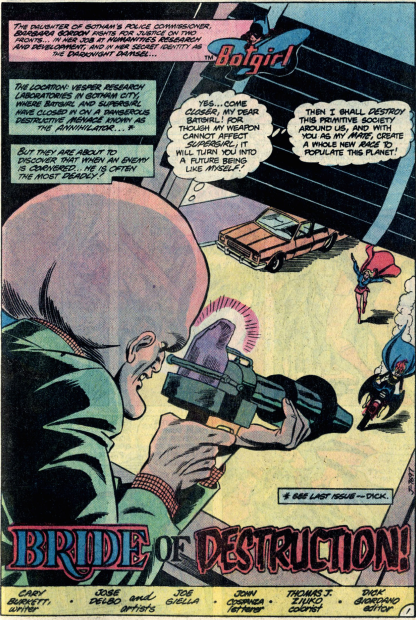 This was the only time Supergirl guest-starred in Batgirl’s series in Detective. 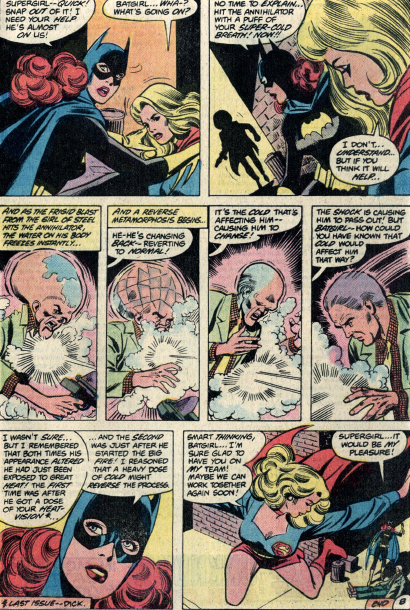 The last time they had teamed up was in the mid-70s, in an early issue of Superman Family. 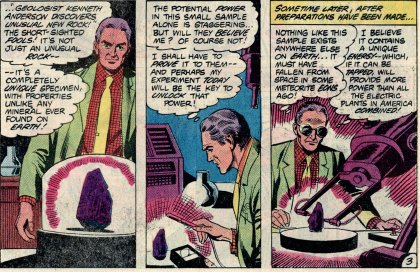 The villain in the story is a scientist, attempting to harness energy from an unusual rock. His process backfires, badly. And, as so often happens, he winds up transforming into a monstrous and destructive creature. 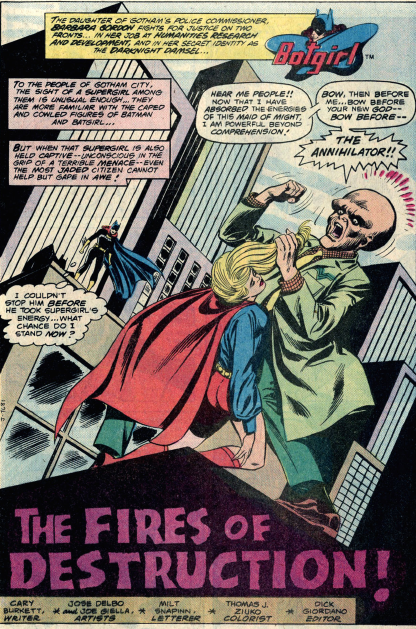 Supergirl only shows up at the end of this chapter, after Batgirl has a very unsuccessful first encounter with the Anhilliator.